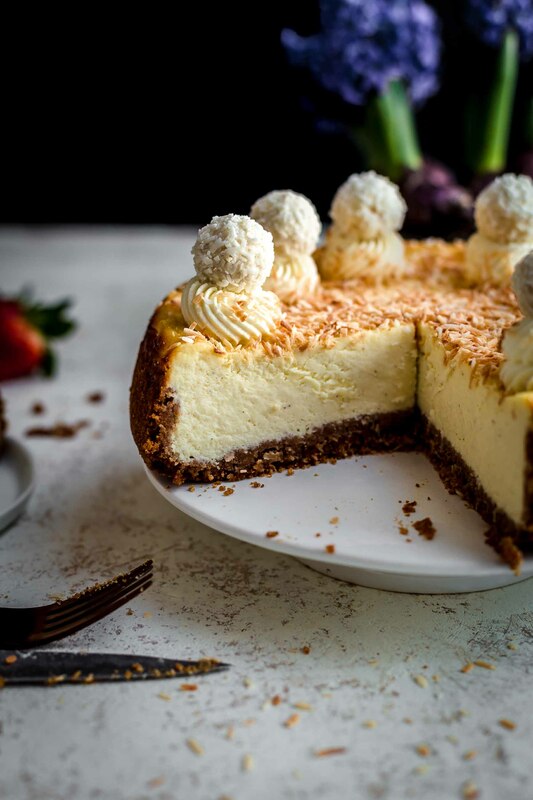 This Coconut Cheesecake recipe is very easy to make. You need just 9 ingredients and 15 minutes of hands-on preparation time. It’s super creamy and delicious and the perfect cheesecake for every occasion. It comes with a coconut graham cracker crust and a coconut cheesecake filling. Detailed step-by-step instructions with photos and video. 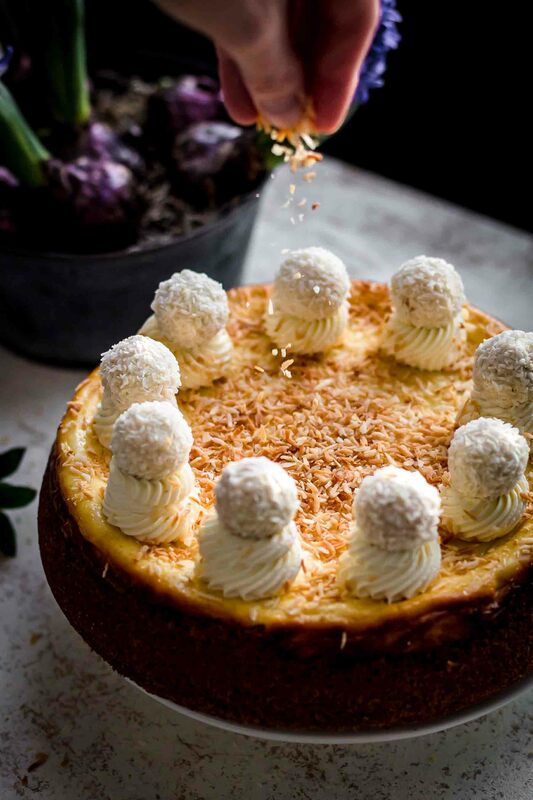 Easter is knocking on our doors, and which better way can you think of celebrating it than with this Coconut Cheesecake? Exactly. I don’t know it either. Think of super creamy coconut cheesecake filling combined with an incredible coconut graham cracker crust. Coconut flavor guaranteed. 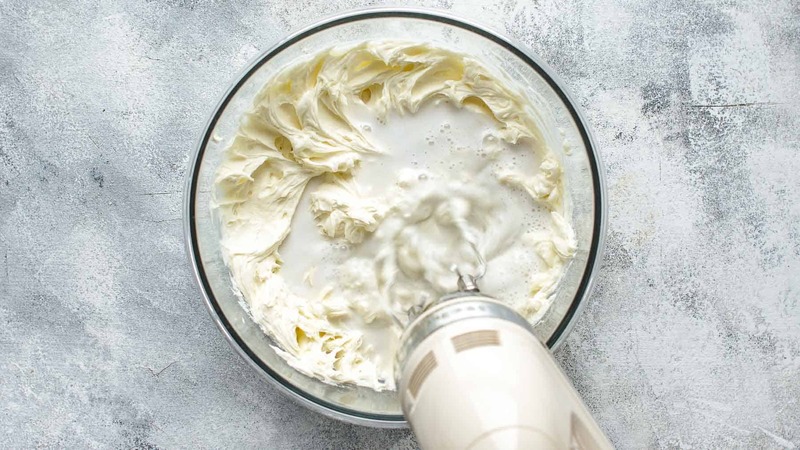 I walk you through the whole process of making Coconut Cheesecake step-by-step. It’s very easy and quick to make. This cheesecake is definitely a crowd pleaser. Start with lining the springform pan with parchment paper. If you cover the bottom and the sides of the springform pan, you don’t need to worry about how to remove cheesecake from the springform pan. After baking and chilling, just open the pan and remove the paper from the cheesecake. Let’s move on to the crust. 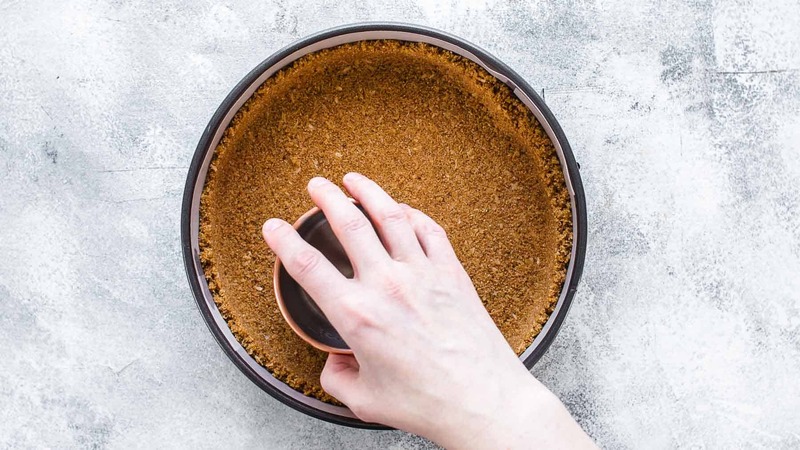 Graham cracker crumbs, toasted coconut flakes, sugar, and coconut oil is what you need for the crust. 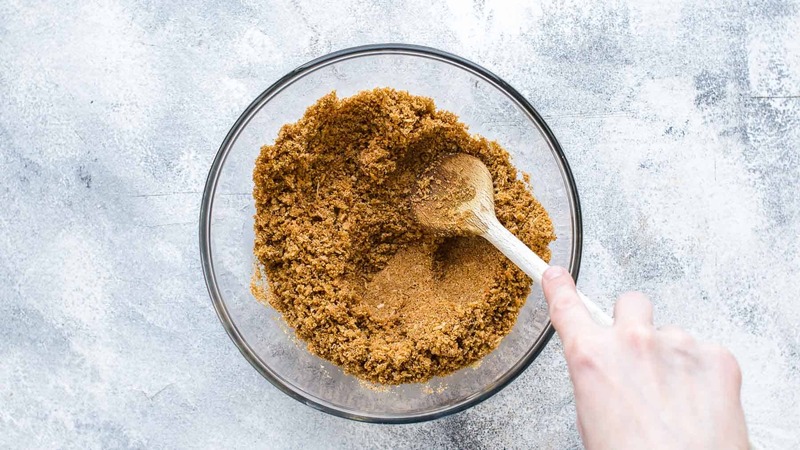 The fastest way to get graham cracker crumbs is to place the graham crackers in a food processor and pulse a few seconds until finely ground into crumbs. Alternatively, you can place them in a zip-lock bag and smash them with the rolling pin into fine crumbs. I highly recommend using toasted coconut flakes because they add more flavor to the crust. If you don’t find them at the store, buy regular coconut flakes and toast them at home. Therefore, preheat oven to 325°F / 160°C and line a baking sheet with parchment paper. Evenly place coconut flakes in one layer on the baking sheet and bake for 2-5 minutes until golden brown. Watch them closely because they tend to brown and burn very quickly. Then combine graham cracker crumbs, toasted coconut flakes, sugar, and melted coconut oil in a large bowl. Stir until evenly moistened. This works best with a rubber spatula or a wooden spoon. It should look like in the picture below. Transfer to the prepared springform pan and press the crumbs with the back of a flat bottomed cup into the bottom of the pan and halfway up the sides. Bake for 10 minutes while you prepare the filling. Let’s move on to the filling. Start with beating the cream cheese, sugar, and flour. 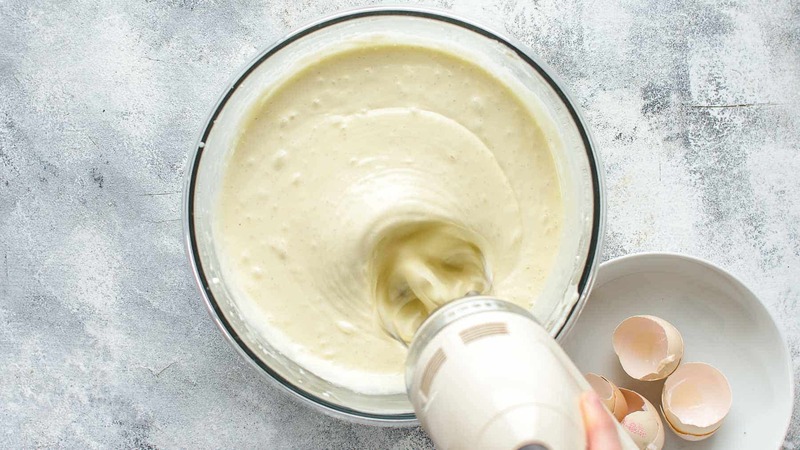 Mix just until combined, smooth, and no lumps remain. 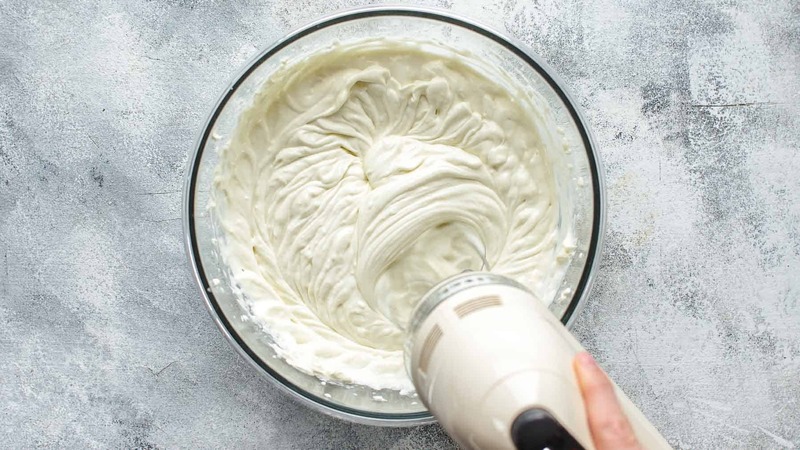 I recommend using room temperature cream cheese because it combines faster and better with the other ingredients. 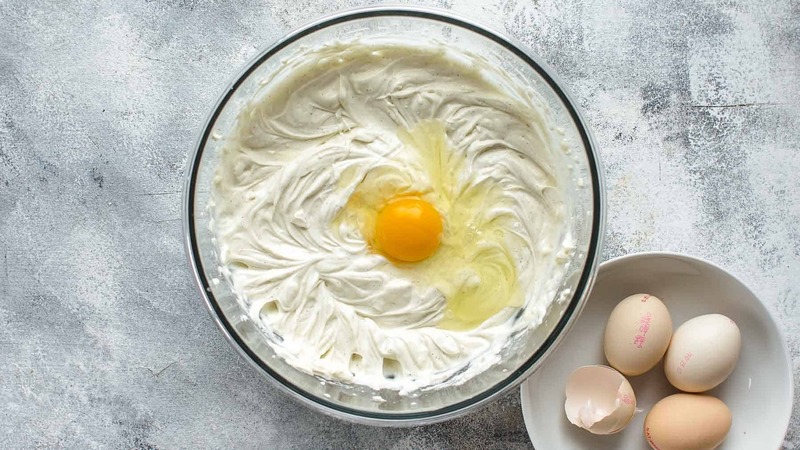 If the cream cheese is too cold, you tend to overmix it to get rid of any lumps. The recipe works with brick style Philadelphia cheesecake as well as spreadable Philadelphia cream cheese. Transfer the whole inside of the coconut can (coconut pulp, fat, water) to a heat-proof bowl. Then microwave for about 20-30 seconds until you see the fat melting down. Do not overheat. It should not be hot. Stop when you see that it starts melting. Then blend with an immersion blender until smooth. Voilá. You have smooth and creamy coconut milk. 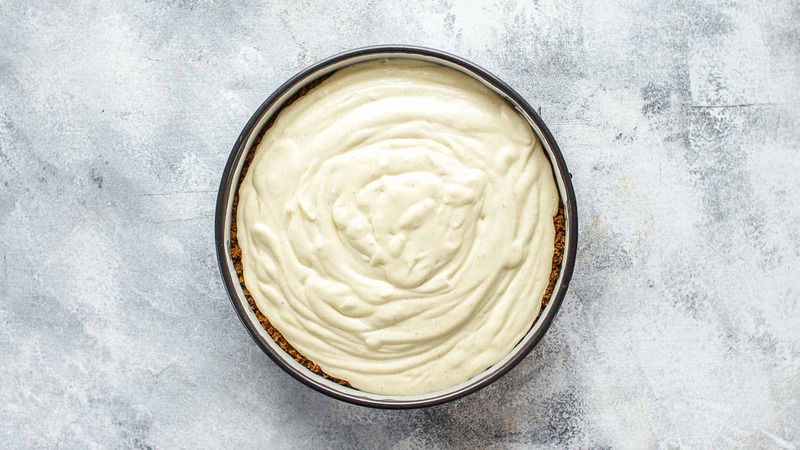 In this case, you make sure that your cheesecake does turn out great because you use all parts of the coconut milk, the pulp, the fat, and the water, equally. If you have coconut milk which is already smooth and creamy, then you can use it right away. It should look like in the picture below. Then mix just until combined. You don’t need to wrap aluminum foil around the pan to catch the liquid which is leaking during the baking process. I always place a piece of parchment paper under the pan while baking. The paper prevents liquid from dropping on the bottom of your oven. Then bake until the top is just set with puffed edges. To tell when your coconut cheesecake is done, gently shake the pan. The edges should be very lightly browned and set with a slight jiggle in the center. The wobbly center should be about 4 inches in diameter and very bright and shiny. You can see in the picture below that the surface around the edges looks different than the center. The edges are puffed and matt and the center shiny. There where it is shiny, it should still wobble when shaking the pan. Cheesecake needs to cool down slowly to prevent it from cracking. That’s the reason why it is still another hour in the oven when it is turned off. Crack open the door. After this hour let it cool to room temperature and then chill it in the fridge for a couple of hours. 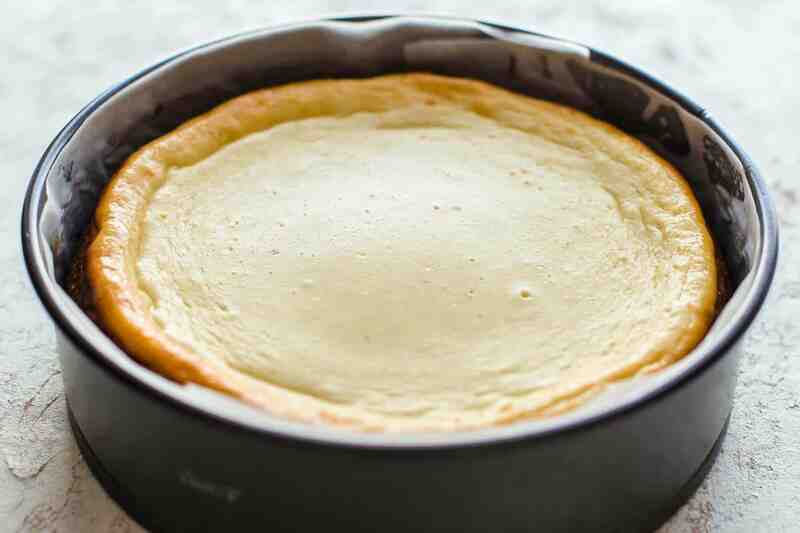 Read here my tips to prevent cracking cheesecakes. 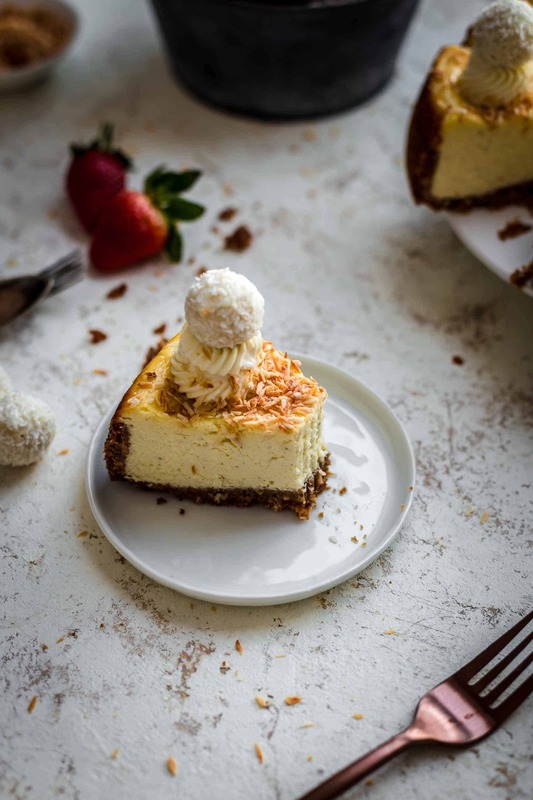 Top your Coconut Cheesecake with toasted coconut flakes, whipping cream, cream cheese frosting, strawberry sauce, or coconut almond confection. Also, chocolate ganache or caramel sauce would fit great. Think of any topping which suits coconut or cheesecake in general. 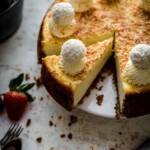 HOW TO CONVERT COCONUT CHEESECAKE INTO MINI COCONUT CHEESECAKES? If you want to make the whole recipe, you will end up with 24 Mini Coconut Cheesecake Muffins or 12 ramekin-sized Mini Cheesecakes. You could divide the recipe in half for 12 cheesecake muffins or 6 ramekin-sized mini cheesecakes. Line ramekins with parchment paper or a muffin pan with cupcake liners. Make the crust as described and press into the bottom of the ramekins or liners. Prebake for 5 minutes. Make the filling according to the directions and fill into the prebaked crust. Bake ramekins for 20-23 minutes and muffins for 13-15 minutes. If you are on a gluten-free diet, substitute the all-purpose flour for Bob’s Red Mill gluten-free flour. In this case, you may want to go with gluten-free crackers as well. Substitute 1:1. You could decide to go with another crust like Oreo crust. Find a recipe for Oreo crust here. 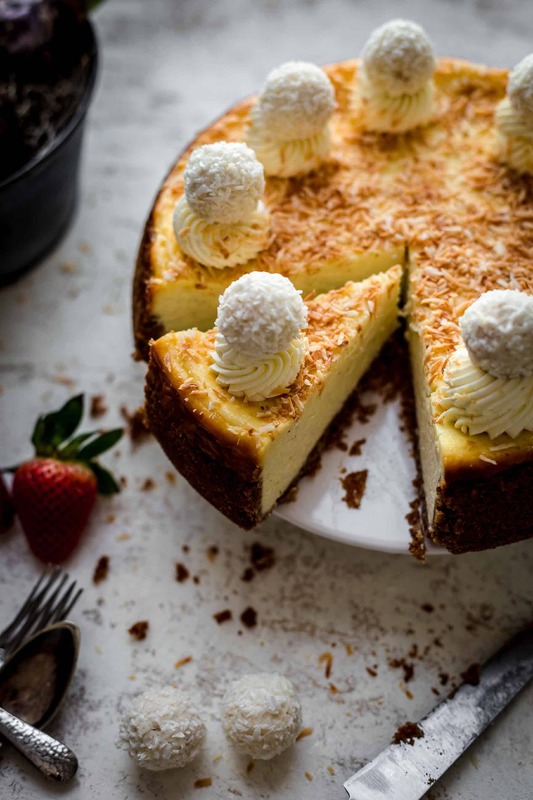 If you make this Coconut Cheesecake Recipe, leave a comment, rate it and tag a photo #alsothecrumbsplease on Instagram! Would love to see your snap! Click here to see all recipes. This Coconut Cheesecake recipe is very easy to make. You need just 9 ingredients and 15 minutes of hands-on preparation time. It's super creamy and delicious and the perfect cheesecake for every occasion. 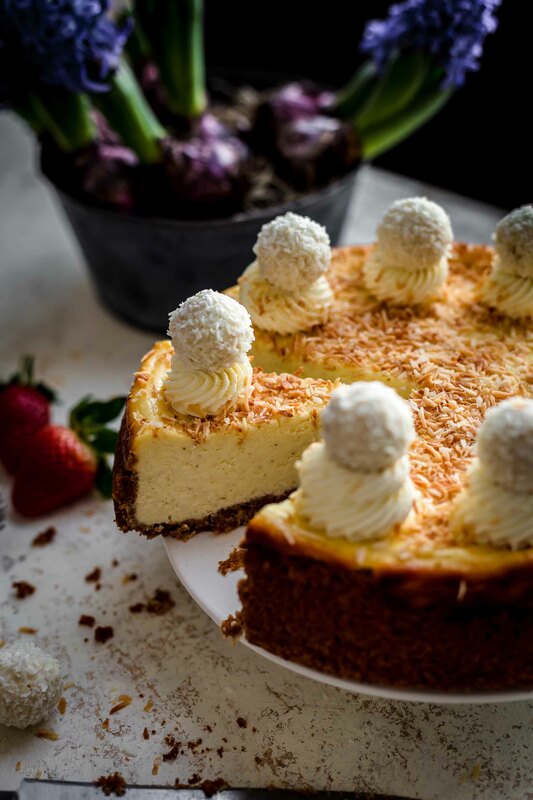 It comes with a coconut graham cracker crust and a coconut cheesecake filling. Detailed step-by-step instructions with photos and video. Coconut Graham Cracker Crust: In a large bowl stir together graham cracker crumbs, toasted coconut flakes*, sugar, and melted coconut oil/butter until combined and evenly moistened. 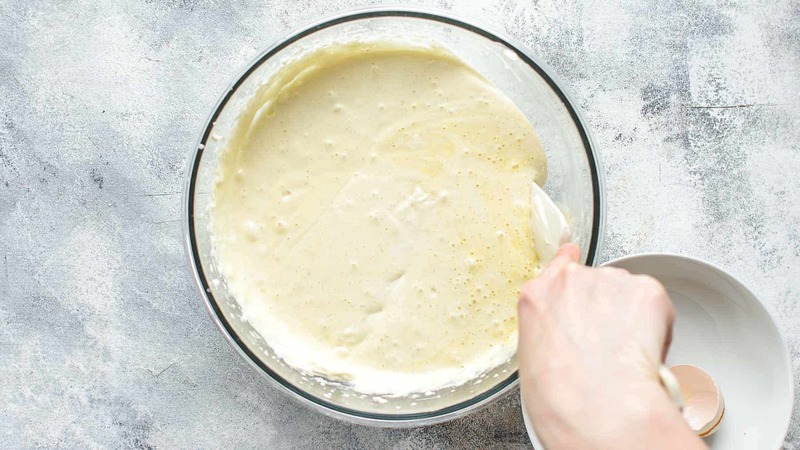 Transfer to the prepared pan and press crumbs into the bottom and halfway up the sides with the back of a measuring cup. Bake for 10 minutes. In the meantime, prepare the filling. 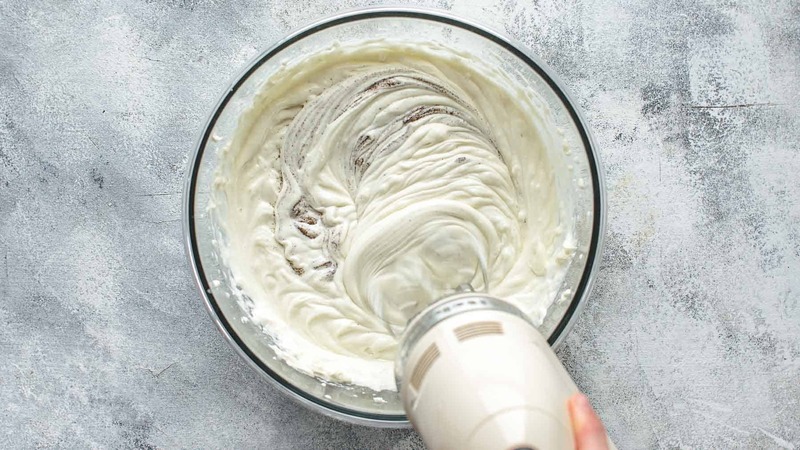 Coconut Cheesecake Filling: In a large mixing bowl, using a handheld or stand mixer fitted with a whisk or paddle attachment, beat the cream cheese, sugar, and flour just until combined, smooth and no lumps remain. Add coconut milk** and vanilla*** and mix to combine. Add one egg at the time and mix just until combined before you add the next egg. 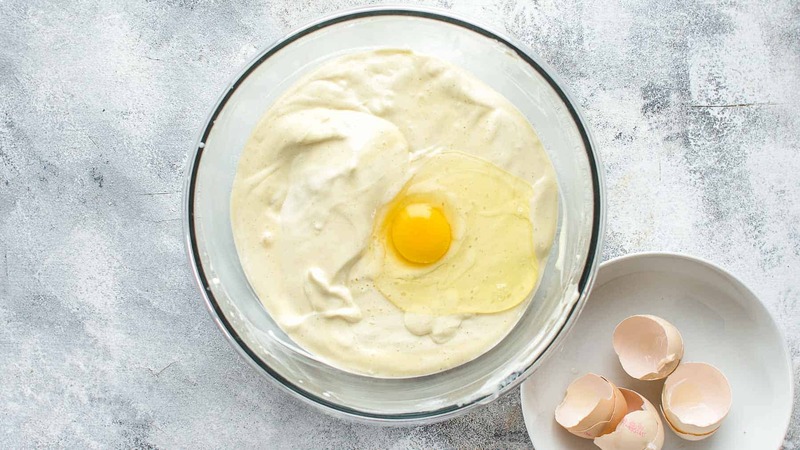 Scrape down the bowl before you add the last egg and mix until combined. Don't overmix. Too much air in the filling can cause cracks while baking. Pour filling into the crust and spread evenly. 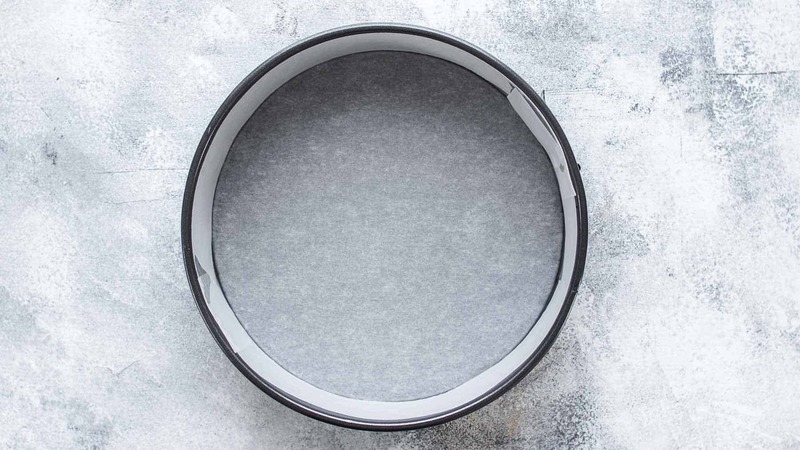 Place a piece of parchment paper under the springform pan and bake for 45-55 minutes until the edges look puffed and the top is set with a lightly wobble underneath. It still should wobble like pudding when you turn off the oven. Don't overbake. I baked mine for 50 minutes. *If you don't get toasted coconut flakes at the store do the following: Preheat oven to 325°F / 160°C and line a baking sheet with parchment paper. Place coconut flakes in one layer on the baking sheet and bake for 2-5 minutes. Watch closely because they tend to brown and burn quickly. **If your coconut milk is not smooth and creamy but very thin coconut water is in the bottom of your can with firm coconut pulp and fat on top, then do the following: Transfer the whole inside of the coconut can (coconut pulp, fat, water) to a heat-proof bowl. Then microwave for about 20-30 seconds until you see the fat melting down. Do not overheat. It should not be hot. Stop when you see that it starts melting. Then blend with an immersion blender until smooth. If your coconut milk is creamy and smooth straight out of the container you can use it right away. ***First, cut off the straight end of the vanilla bean. Then place the tip of your knife below the curled end and cut the vanilla bean through the middle of the bean lengthwise with a sharp knife. Although you don't need to cut it all the way through, it's ok when you do so. Then open the vanilla bean and scrape out the flavorful seeds with the back of your knife. Just use the seeds. Watch the 65 seconds video to see the whole process. Read the blog post for additional information on how to freeze Coconut Cheesecake, how to make Mini Coconut Cheesecakes, substitutions, etc. What did you decorate the cheesecake with? It looks amazing. Can hardly wait to make this!! I decorated it with toasted coconut flakes, cream cheese frosting, and Raffaello. Thank you so much!